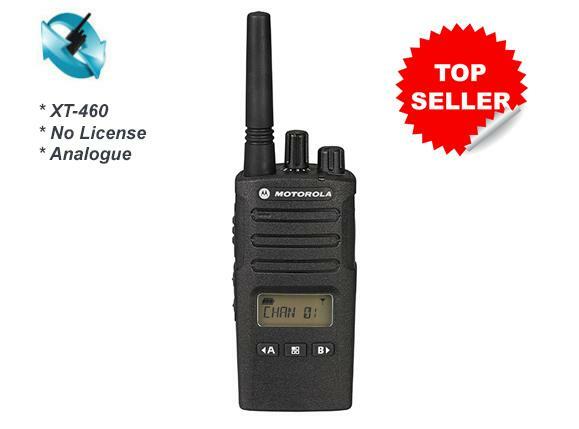 Motorola XT460 wireless two-way radios have the business smarts to help people work better together – coordinating resources at the construction site or monitoring production on the manufacturing line. They come with the right credentials to give business the competitive edge: exceptional quality, affordability and durability to outlast high noise, tough conditions and hard use. Buy some now. Exceptional value and Motorola quality. Focus on the job with instant push-to-talk and customised channel announcements that keep your hands free. Now you’ll know which channel and which department you are talking to without removing the radio from your belt. The XT460 delivers loud and clear audio output thanks to its powerful built-in loudspeaker and the user can select between 8 channels and 219 privacy codes to help ensure a clear signal. XT460 radios make it easy to get the work done. Compact yet performance-packed, the XT460 provides coverage up to 16 250 m2, 13 floors or 9km line of sight1 with voice prompts that enable you to programme non-display radios on the go. A carry holster with swivel belt clip lets you rotate the radio to fit comfortably and move freely while picking up a tool or restocking a shelf and the antimicrobial coating helps prevent the growth of mould and germs on the surface of the radio – as you change shifts, pass on the radio confidently. Military Standard 810 C, D, E, F and G plus IP55 may be the standards for other radio manufacturers, but they are the starting point for our XT400 Series. These radios undergo Motorola’s unique Accelerated Life Testing (ALT). This rigorous laboratory testing simulates up to 5 years of field use. We design and build the XT460 right the first time to minimize costly repairs and downtime. The HTML-based Customer Programming Software is so easy to use, it works with any computer browser. Profiles are interchangeable with the XTNi Series too. You can quickly copy settings between XT400 Series radios or between XTNi and XT460 portables with the radio-to-radio cloning cable or through the Multi-Unit Charger. Plus you can re-use your XTNi audio accessories to unleash the power of your XT460 radios. Price includes charger and battery.